A Dracula novel should be creepy, atmospheric, and steeped in Old World superstition. Stoker's Manuscript hits the mark in its tale about the rare original manuscript of Bram Stoker's Dracula, a manuscript with parts unpublished. Joseph Barkeley, a resident of Chicago, is a rare manuscript expert who is contacted by an overseas buyer through his representative to authenticate and purchase the Stoker manuscript before it goes to auction. The representative insists on anonymity for the buyer and personal delivery of the purchase. The representative doesn't divulge the buyer's name, but the location is determined to be Dracula's Castle in Romania, and thus begins Barkeley's descent into a world of dark and danger. The fact that Joseph and his brother Bernhardt were rescued from a Romanian orphanage as small children plays into the plot with revealing secrets of they why and how of their parents' deaths. Coming face to face with the unknown son of Vlad Dracul, Joseph must unravel they mysteries of his own lineage as well as those that Dalca demands if he is to survive. However, it soon becomes clear that personal survival pales in comparison to the task that Joseph must choose to either pursue or flee. The best part of this debut novel by Royce Prouty is the atmosphere he created in which his story plays out. The Romanian countryside and its people are delightfully spooky and superstition-filled. Choosing to accentuate the ruthlessness of the family Dracul, Prouty brings to his readers a cringe-worthy accounting of vampire lore. His descriptions of smells is particularly well executed, along with Joseph Barkeley's reaction to them. Personally, I was introduced to some new items concerning vampires, so it was engaging for me on that count, too. The novel did for me what I had hoped it would, deliver a scary tale with intriguing back story. *** Received from First Reads giveaways***I had a hard time getting into the story when I was reading this book. I think it is partially because I didn't think the main character was a very interesting character at all, he was mostly dull and a rather uninspiring hero. The last half of the book the action and the character became more interesting since there was more happening rather than just getting a lot of background history on events that happened in the past. The background history was interesting, but it did slow the book a bit. A few writing things I noticed that seemed to jar me out of the story was the way the author wrote people's accents. For example he wrote "promis you will heed my warnings." Vornings in italics to show how the character substituted V for W or Z for S instead of just putting Vorning into the sentence since he had already explained that the character was doing it. Overall a good book but not one that blew me away. As Dracula by Bram Stoker is one of my most favourite classics of all time and as an avid reader of gothic and vampire fiction, this book needed to be read by me! And one thing: don’t read it at night if you’re faint-hearted! There are scenes which are very graphic. Through the use of spare prose, the nightmarish stuff is highlighted even more and Royce Prouty does not use euphemisms like Stoker does. What I like most about this novel is the blend of historical facts and Dracula and the interplay with Joseph Barkeley’s life who is an antiquarian book dealer and authenticator of rare manuscripts. One day he is called by a mysterious buyer who wants him to authenticate the original Dracula manuscript and Stoker’s notes and when he agrees, he doesn’t realise that this decision will change his life forever. He’s invited to come to Romania and too late does he discover that the lines between fiction and fact can be blurred and that there’s nowhere to return. I won’t get more into the story line as I don’t want to spoiler you.If you’re a fan of vampires and the masterpiece “Dracula” I truly believe that you’ll like this book. The atmosphere stays very true to its inspiration and the way Prouty mixes historical facts with his own unique vampire mythology and traditional vampire lore is fascinating. A fascinating new take on 'Dracula,' with a bibliophile perspective. Joseph, a Chicago antiquarian book dealer, gets a mysterious offer to purchase the original manuscript and notes of Bram Stoker's now-famous vampire novel. But what other secrets are in the edited (or censored) chapters? And Joseph's own orphaned past, along with his priest brother, go back to Romania, where the manuscript is to be shipped.The book-dealing and research aspects intrigued me more than the rehashed vampire suspense. The combination is interesting, but (slight spoiler) Prouty's narration flips from intense gory scenes to bookish research. There's a bit of a Tim Brown quality to the story, which I don't like; multi-layered and multi-lingual symbols that suddenly make sense and lead to more clues. The side story attributing Nicola Tesla to Stoker, however, is fascinating. but again, the wrap-up of inter-family vampire fights becomes a bit entangled.Still, it's an engaging and well-paced tale. I won this book in a Goodreads First Reads Giveaway. This was definitely not what I had thought the book would be like when I entered to win it. First, the main character was VERY boring and dry. I could not connect with him at all. Then, the author wrote out accents after he would write a sentence. This was so distracting. I found myself re-reading what I had already read in the accent. I guess if he wanted us to read it as it was being said then why not just write it that way to begin and end with? For example, a sentence would be: Yes, she replied. Yezz. I mean, why not just put it as Yezz, she replied? I would have gotten that and it would have been less distracting. There is not too much I can say about the book. The author is very good at writing and was well versed in the subject, it was just to bland for me. I DID read the entire book even though I wanted to just give up. The writing isn't brilliant and at times - repetitive, but the story is old-school, East European-style vampire (not the YA nonsense), full of atmosphere, old traditions and the people who still live them, which I can't resist. The plot is very gripping, and even though the main character isn't very likable, he is still interesting, and so are other characters around him. There is some historical background which gives it all credibility and adds another level of interest. Enjoyable, quick read. I had a tough time with Royce Prouty's; Stoker's Manuscript. I loved the subject matter and the premise but felt the delivery of the novel to be disjointed and uneven. Much like a good movie torn apart on the editing floor...."You already did, by agreeing to go. There's danger there, a type not like here. You won't like what you see, Joseph, and you'll never be able to purge it from your memory." "Can I have your blessing?" "If only I could," he said. "Where you are going, God's eyes do not watch. "...Joseph Barkeley, a manuscript authenticator, is commissioned to procure the original draft and notes of Bram Stoker's classic novel, Dracula. The buyer is from the oldest family in Transylvania and wants the manuscript delivered to the legendary Castel Bram in Romania. The birthplace of Joseph, where he was orphaned as a child.In researching the piece Joseph finds that the original manuscript has a different beginning and ending than does the novel that has been published since. In the notes there are passages of graveyards and secret burials. Barkeley travels to Romania with the manuscript and finds that the buyer is descended from Vlad the Impaler, whom the character of Dracula was based upon. It is this descendant who wishes the forgotten text of the manuscript to find the most desired of the what the family needs to carry on. This descendant who is far more than he seems...."Herr Barkeley." My host shook a finger at me. "Beware the dark." "I'll be careful." "Die Todten reiten schnell...faster than you." The dead travel fast...Much like Jonathan Harker before him, Joseph Barkeley embarks on his mission and steps directly into the web of darkness and vampires. Unlike Harker, Joseph finds his own family history tied to the legends of the Castel Bram. Until he must decide whether his actions will increase the power of evil or if he can destroy it.Unfortunately, unlike the heroes and heroines of Dracula, you never really feel like rooting for Barkeley. His depressive attitude and self serving greed make him pretty unlikeable. His actions contribute to the deaths of those he holds dear as he falls in servitude to the Dark Prince. The Dark Prince himself is poorly rendered image of a vampire that has survived for centuries untold yet loses a debate with Joseph over the merits of his faith in Christianity. When you decide to take on something like Bram Stoker's Dracula and expand on the original; there should be a sense of respect for the original that demands a much better effort.Overall the premise and subject could have been done much better. This book will leave you with a sense of so much promise and yet so little delivered. 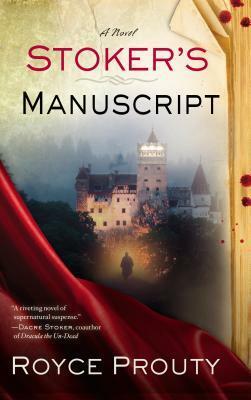 When rare-manuscript expert Joseph Barkeley is hired to authenticate and purchase the original draft and notes for Bram Stoker's Dracula, little does he know that the reclusive buyer is a member of the oldest family in Transylvania.After delivering the manuscript to the legendary Bran Castle in Romania, Barkeley—a Romanian orphan himself—realizes to his horror that he's become a prisoner to the son of Vlad Dracul. To earn his freedom, Barkeley must decipher cryptic messages hidden in the text of the original Dracula that reveal the burial sites of certain Dracul family members. Barkeley's only hope is to ensure that he does not exhaust his usefulness to his captor until he’s able to escape. Soon he discovers secrets about his own lineage that suggest his selection for the task was more than coincidence. In this knowledge may lie Barkeley's salvation—or his doom. For now he must choose between a coward's flight and a mortal conflict against an ancient foe.Building on actual international events surrounding the publication of Bram Stoker's original novel, Royce Prouty has written a spellbinding debut novel that ranges from 1890s Chicago, London, and Transylvania to the perilous present.I really liked this book. It was a fast and easy weekend read for me. The author Royce Prouty did a great job by having a mystery that draws on real life events surrounding the publication of "Dracula". I think this would be a great read for almost anyone, but especially to fans of the original Bram Stoker's "Dracula". You should be warned though this is not your Twilight kind of vampire book. This book is darker and more fighting in a very good way.The story did remind me a bit of "The Ninth Gate" but this story stands all on it's own. I also would not be surprised to see a sequel in the near future. Once the hook is set, this book is hard to put down.It's been a while since I have read Dracula but I do recall being told of some of the weirdness surrounding that novel's initial publication (last-minute editorial changes, suspected arson hitting both Stoker's workplace and publisher). Prouty builds upon that stuff and then throws in other bits of history for good measure. This book could have been a wee bit shorter. I ended up skimming two or three chapters (the sort which detail obvious solutions to mechanical problems) because I wanted to finish it all in one night.Narratively this book is closer to The Da Vinci Code then Dracula. It helps that the sentence structure is decent, unlike Dan Brown. But this book is very much a "thriller" which I don't often venture into. If this was more of a "literary" work then perhaps Stoker's model would have been hewn to more closely stylistically, but it's not. Which is perfectly fine, since Stoker's novel is really not literary at all, & the way that Stoker used the epistolary form is confusing as hell what with the overlapping time-lapses from letters being mailed and diaries discovered. But Prouty's entire book is essentially one long diary entry which ends up making little to no sense upon the finish. Definitely worth picking up if one is a Gothic Horror aficionado or has the vampire bug. Stoker's Manuscript by Royce Prouty, This was hard to put down once started.Dracula, Bram Stoker's classic horror novel and known by all , a great work of fiction. Or was it?Joseph Barkeley is hired to authenticate the original draft copy and until now unknown notes with a prolog and epilog that was not included in the published copy.Why?As Joseph delivers the copy and authentication to the unknown buyer as per contact he learns that not all of Vlad's children were known and it would seem dead.Joseph a Romanian orphan himself along with his brother learns more of his parents death. His mother was murdered by his father for, for being in league with Vampires.Could all this be true?and if so will Joseph survive?This was a good read and Prouty does well of telling the story so as to blend in with all we know of Dracula. Included are some truths of Stoker and his journal.This would be a great addition to any horror collection or just a good book.The characters are well developed and you can feel for them.With fall coming and all Hallows Eve, gather round the fire, read and glance at the shadows and wonder. 2.5 stars--somewhere between "it was okay" and "I liked it. "This book has an amazing premise. What if Stoker knew the real location of vampire burial sites, and included hints of these locations in early drafts of Dracula? I love the idea of using the text as a treasure map, and the vampire lore in this novel is well done, with creepy vampires and lots of menace. However, for such a neat premise, the book sure is dull. The main character is passive and bland; I couldn't tell you a single one of his character traits because I'm not sure he had any! The Romanian setting doesn't rise above stereotypes (neglected orphans and superstitious villagers), the plot is muddled, and the book sometimes doesn't follow its own rules. (For example, the vampires spy on the narrator and always know what he's doing, always--unless it's something that needs to be kept secret due to plot reasons, and then suddenly the vampires didn't see or hear. )I'm also not sure the ending really ENDED anything.I listened to the audiobook, and the reader was great. A first novel and a really good effort. A mix of Romanian history and Bram Stoker and Dracula. Starting with orphaned brothers in Chicago, one a priest and one a rare manuscript expert is offered a deal he can't refuse what would you do with -- and for -- four million dollars? Vlad Dracul is set up a little like a Mafia Don and our hero realizes that there are time that even someone who is a meek, sheltered, nerdy coward can be put in a position where he must be brave. There is some gory violence, and though some of the guesses made by the expert seem too random to be correct (and yet they are!) it works for the story and i found myself delighted at the author's inventiveness. Note: The end of the story does seem to set the reader up for a second - but I am hoping that this is not a 'book a year' kind of author. He's off to a great start - but the pressure to pump out another in the series can diminish the plot. Royce Prouty's "Stoker's Manuscript" is a modern vampire story that takes an American book authenticator born in Romania back to his roots in a way he never would have imagined. Joseph Barkeley is hired to bring Bram Stoker's original manuscript to Transylvania for a very large sum of money, but why? Turns out some of the real Dracula's relatives don't want the rest of the world to find out secrets contained in the original version, and they'll stop at nothing to keep their secrets.If you're a fan of Bram Stoker's masterpiece, as I am, I believe you'd probably enjoy this novel. The only thing I can fault is that there was a bit too much info about Joseph's study of paper. I look forward to more of Mr. Prouty's work. Stoker’s Manuscript by Royce Prouty is an interesting take on the Dracula myth. This is an engrossing first novel. The basic plot involves a high-end used book dealer, Joseph Barkeley. He is hired to authenticate and purchase the original manuscript of Dracula along with all of Bram Stoker’s notes for an anonymous Eastern European buyer prior to their auction, and then personally deliver the manuscript to the buyer. In the course of researching the manuscript and making the purchase, Barkeley finds himself embroiled in a mystery that involves himself, his brother, his family’s past, and the legends of the former country of Wallachia. The people he consults are later threatened and/or killed. Barkeley is slowly boxed in and trapped by the anonymous buyer. He is forced to continue his investigations under penalty of a brutal death. As Barkeley slowly pieces together the clues from the manuscript, notes and other sources, including a document and letters from a one-time assistant to Dr. Edward Teller, his time is running out. The mysteries involve what vampires actually are and the influence that the Dracul family still exerts in the region. This is further complicated by two of Vlad Tepes’ (Dracula’s) brothers whose wives have been hidden for centuries and are feuding to find them and breed again.This is only a quick outline of a very intriguing read in the vampire genre. It’s well researched and fairly well written. I was thoroughly drawn into the mystery. My only criticisms were that there were places where my suspension of disbelief over some of the events didn’t carry me through. I was also confused about some of the events, but perhaps I wasn’t reading as close as I could have been. It isn’t clear to me exactly what the feud involves other than a power struggle between brothers. In some ways, Stoker’s Manuscript recalled to mind Elizabeth Kostova’s excellent 2005 first novel, The Historian, which offered her own take on the Dracula legend. Stoker’s Manuscript isn’t quite as well-researched as Kostova’s novel, but it was very good. I easily recommend it to readers who enjoy good mysteries and suspense, and also to those who like vampires that are not of the Twilight kind. If you're a fan of Bram Stoker's Dracula, then Stoker's Manuscript is a must-read. As the name of the book implies, Stoker's original manuscript features prominently in the narrative as the main character, Joseph Barkeley, a rare book and manuscript expert, is hired to 1) authenticate it, and 2) broker a deal to purchase it from a museum for a mysterious, unnamed client. When Barkeley agrees, he doesn't realize that it will change his life irrevocably. The mysterious client is someone, no, something, Joseph never imagined existed, and Stoker's manuscript contains the clues that lead to what he most desires. Either Joseph will decode the clues and find it, or he will die. Of course, once he's "outlived his usefulness," he'll still die. What a choice! As Joseph stalls, he does indeed begin to decode the manuscript, but unexpectedly, along the way he also discovers that he is much more a part of this whole situation than he ever imagined. Can he unravel the mystery and save himself and those he loves?The atmosphere created in this book was very reminiscent of that in Stoker's Dracula. Some aspects of the story also echo Stoker's plot, such as Joseph's "stay" in Dracula's castle (paralleling that of Jonathan Harker). Prouty also presents a completely different take on vampires from any that I have read elsewhere. These creatures are not sparkly or handsome or anything remotely appealing (they even stink). Of course, others have also depicted vampires in this light, but it's Prouty's ideas about vampire reproduction that I found interesting and different. There are warring factions of vampires, and apparently what has caused the in-fighting is essentially breeding rights. Vampire females are in short supply, and it seems that the preferred method of revenge is stealing and burying your rival's wife. As a librarian and archivist, I found all the library, archive, and museum parts (because of course, Joseph has to do his research!) interesting. Prouty put the events surround Stoker's manuscript into context by also connecting them with the work of Tesla. After reading the synopsis of the book, I, of course, was intrigued and added it to my "To read" list. I went into it expecting a nicely crafted, chilling reading experience...but was left scratching my head because it managed to be fairly formulaic and dull. Therefore, I give it a rating of 3 because it was average/decent, and even that is being generous.I still enjoyed aspects of the story, and unsettling feelings arose within me during occasional moments, but the first-person narration destroyed most of the suspense for me. If done well, first-person narration can work quite well, but that wasn't the case here. It eliminated any feelings of dread in regards to the protagonist's well being. He, Joseph, ventured off into some very perilous locations/situations, but you knew he'd be just fine because he related everything to you. Speaking of the protagonist, he seemed to willingly accept the existence of vampires. He took his crucifix, the knowledge that he must slay a vampire, and marched right into Romania. He learned of the deaths of close friends in the U.S., saw people impale themselves by jumping from great heights onto stakes/"debris" of the corpses splattered him a few times, and saw his own brother be bitten by Dalca, son of Vlad III, yet managed to take it all in stride. What should have been a thrill was, overall, a bit mundane and boring. I never actually seemed to fully immerse myself in the story. From the beginning, I was unable to forge a connection and reached the point of hoping that the story would come to a swift conclusion, which are never good signs. I think possibly this "sub-genre" of the vampire novel may not be one for me. I tried The Historian and found it (for me) a complete waste of time. This one I didn't really dislike but I did find myself wandering away from it and "taking my time" getting back to it. Joseph Barkeley a rare book dealer and expert makes one of the classic mistakes of horror literature. he rationalizes a decision that will make him a huge amount of money and ignores a warning from a Nun. Thus the said "horror" ensues.It's not a bad book. I found the idea an involving one. Barkeley asked to authenticate an original first draft of Bram Stoker's Dracula manuscript and act as an agent for a mysterious buyer (in Transylvania) sounds really enthralling. It is...sometimes. Sadly there are other times when the book simply yawns and takes a break or something. I would be reading along and then find myself trudging along.We do get to a fairly interesting story with a good climax. The book ends in a way the ties up the story...but also leaves a door open for a sequel (what doesn't anymore?). I'm not really disappointed but neither am I enthusiastic. If there is a sequel i don't know if I'll read it...I don't plan to buy it.So see what you think. Did you like The Historian? This reminds me of it a bit but is much more (to me) interesting. Hope that helps. Can't really give my recommendation to this one but you might want to try it yourself. I thought this would be a good Halloween book, and it's fine, but it could have been great. The story is original - a Transylvanian orphan in Chicago enlisted to authenticate an unpublished edition of Bram Stoker's Dracula finds himself wrapped up in a war among vampires and has to use clues from the book to survive. But the book itself is blunt, with minimal connective tissue. We might get a page of lush description of the Romanian countryside, but we more often get the main character hopping to Chicago, Wisconsin, Romania, Philadelphia, and back in fifty pages. In one scene, he is present at this horrific blood ritual, and he seems trapped, and on the next page, he's home with no explanation of his escape. Conversations carry a good creepy tone, but the sentences are usually efficient exposition instead of a more natural languid flow. I would read future work from this author, but his debut novel has room for improvement. Several months ago I reviewed The Romanov Cross by Robert Masello, a supernatural thriller, which I gave five stars. My latest read, Stoker’s Manuscript by Royce Prouty, is an equally good supernatural thriller. It concerns a rare-manuscript expert who is hired to authenticate and purchase the original draft and notes for Bram Stoker’s classic, Dracula. Upon delivering the manuscript to the client at Castel Bran in Romania, he is horrified to learn that he has become a prisoner to Vlad Dracul’s son, who wants him to find the burial sites of Dracul family members so they can be brought back to life. Weaving together science, history, and the supernatural, Prouty’s first novel weaves a compelling, suspenseful tale. Five stars. Joseph Barkley and his brother, Bernhardt, are orphans, rescued from the hell of Ceausescu's Romania and sent to Chicago. Years later, Bernhardt is a priest and Joseph is an antiquarian bookseller. He receives a mysterious telephone call, requesting he verify and obtain the original manuscript of Bram Stoker's Dracula. This brings him back to his homeland and all the vampire legends rampant in this land of superstition. Soon, Joseph discovers intriguing connections between his family history and all those legends. The novel builds on actual historical events surrounding the publication of Stoker's book. The characters are sympathetic and the story is quite accessible. The horror builds slowly and ends at a breakneck pace. Recommended reading for squeamish horror fans. Royce Prouty - Patrick Royce Prouty is a CPA, business consultant, and Harley-Davidson enthusiast. He and his wife live in Southern California. Stoker's Manuscript is his first novel.